While Dallas develops its plan for implementing complete streets, and moves away from its Vehicular Cyclist past of developing roads for cars over people (where bicyclists simply adapt), it’s important to note that other cities still struggle with coordinators who stop positive change for dogma at all costs. We’ve regularly noted how in 2008, Bicycling Magazine ranked the city of Dallas the “worst for bicyclists” in the nation. That year, we supplanted the city of Boston, who had recently shed the ranking after removing its VC bicycle and pedestrian coordinator, and installed an advocate for people first planning. Shortly thereafter, Dallas VC bicycle coordinator was moved to a new position, but still maintained a defiant voice from his blog. 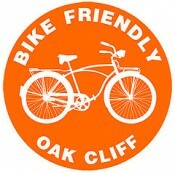 To help in his cause, our former coordinator had friends and fellow Vehicular Cyclists fly in from the city of Orlando to give their own thoughts and ranking of Dallas’ bicycle friendliness. Not surprisingly, the veteran cyclists were overly enthusiastic with how incredible bicycling was in our area, and opined over our wide 6 lane streets, and accommodation for high speed vehicles. The lead picture highlighting their trip showcases a giant Dallas frontage road abutting the massive High Five interchange, with miles of concrete on all sides while a cyclist pedals beside an SUV next to a 40mph street sign. The Florida resident, who leads a similar VC blog in Orlando, regularly assists their city’s bicycle and pedestrian coordinator as well (who also happens to be a militant Vehicular Cyclist), and bemoans bicycle infrastructure projects throughout the nation. Their stance has always been to promote car-first development at all costs with bicycles simply adapting (like in the picture), and marginalizing children, the elderly, or anyone who is unable to pedal above 10mph. Two weeks ago, the city of Orlando was officially ranked the deadliest city for pedestrians in the nation. According to the following research in Sweden, 93% of traffic accidents occur because a vehicle driver was distracted. This is something the “take the lane” mantra does nothing to address, and actually promotes getting in front of potentially distracted drivers. So when we discuss complete streets, and talk about safety issues in infrastructure development, it’s important to note that those who oversee and assist with planning the deadliest streets for people in America, deem Dallas perfect for bicycling. It’s no different than having a fast food lobbiest tell us our incredibly high obesity rates are perfect for kids.